Enquire or book a trip along Cái Bè - Sa Đéc - Châu Đốc - Phnom Penh. Boarding at Cai Be with a local boat through the Cai Be floating market. Boarding on the Bassac, welcome drink, introduction to the ship and crew. Check into cabins. Boarding back about noon at Sa Dec. Welcome back drink. Lunch is served as the Bassac sets sail towards upstream the river. 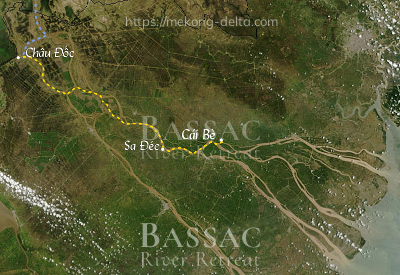 After passing by Cao Lanh, the Bassac enters a small tributary of the river of the Tiger (Song Ho). By mid-afternoon, the Bassac drops the anchor for the visit of a late XIXth century Franciscan monastery on an island, and the surrounding countryside. Upon arrival at Chau Doc, transfer to a local boat for the visit of a floating fish farm on the way and a village of the muslim Cham minority. Transfer early in the morning on board a speedboat, which takes you to the frontier post at Vĩnh Xương for the emigration formalities. Once the formalities have been expedited, boarding back onto the speedboat and departure towards Phnom Penh. Arrival at the pier on the Tonle Sap River in Phnom Penh about three and a half hours after departure, and end of services. End of services on shore at Châu Đốc. Please note you will leave the Bassac for good upon transfer to the speedboat.